To read this story in the Ryerson Review of Journalism, click here. With a ceremonial click of a button, Mel Rothenburger, who’d retired as editor-in-chief in 2012, simultaneously put to bed the last issue of the Kamloops Daily News and an 80-year-old tradition. The front page headline on the January 11 edition read, “I really don’t know what I’m going to do when there’s no paper.” The closure left Kamloops, a city of nearly 90,000 people, without a daily newspaper. Reporter Michele Young had not yet cried during the rough week but nearly broke down when she saw one of her colleague’s watery eyes. Shutting down the paper ended many of its employees’ careers in journalism—and a treasured ritual for the reader. But reactions to that loss seem to say more about a generation gap than the need to be informed. One year later, with easy access to journalism online and from broadcasters, many in the town are finding that a daily paper may be more about the habit than the news. Since it started as the Kamloops Shopper in 1931, the newspaper was something people could count on every day. Although its paid subscribers had dipped to about 10,000 by 2011, the Daily News was still highly regarded in the community for its award-winning news coverage and philanthropic efforts. In 2013, three reporters earned nominations for the National Newspaper Awards for a series criticizing the state of rural health care and a historical feature detailing the murder of three police officers 50 years earlier. And Rothenburger, who was at the paper for over 40 years, won a Jack Webster Foundation lifetime achievement award in 2011. Meanwhile, the Daily News raised money and gave ad space during its notable Raise a Reader and Christmas Cheer Fund campaigns. But the community has other options with five radio stations, including a CBC bureau established in 2012. There are also weekday television newscasts by CFJC-TV. And Rothenburger, who once served a term as mayor, started a news blog called “The Armchair Mayor.” Initially a place for commentary on the closing of the Daily News, the blog now has community news and guest columnists written by former colleagues. Since he’s retired, Rothenburger has time to keep up the blog, posting every few days with short news articles and more thought-provoking opinion pieces. Although the Sun and the Toronto Star both publish news from Oshawa, a daily newspaper becomes part of a community’s fabric: who its citizens are and what they stand for. Now a journalism professor at Oshawa’s Durham College, Legree says this connection stems from citizens identifying with a paper product. 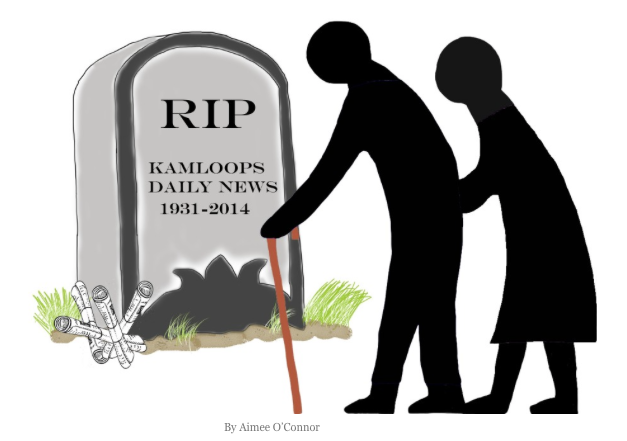 Nearly 20 percent of Kamloops residents are aged 65 and older, part of the generation that grew up with newspapers. In part, the daily paper becomes what Legree calls their “news buddy.” So losing it becomes less about the news and more about the ritual of collecting a paper every morning to mull over with a cup of coffee. When that demographic “goes to their maker,” KTW editor Christopher Foulds hopes to have the right product for the next generation. The paper’s strength is its online presence. So while some readers in Kamloops still complain that they miss their beloved Daily News, there’s news one click away that wasn’t readily available when the Oshawa Times closed. Locally, the KTW does a fine job. The internet provides us with a plethora of worthy reading, on an infinity of topics. And verifying the credibility of the sources is quite easy. We are better off now for sure. Nothing can replace holding a newspaper in your hands and reading it, front to back. Online we pick and choose, and ultimately I dislike going online for news, thus skim headlines and “click” on only say 1 out of 10 headlines. In a newspaper, I can better skim the less relevant articles. Moreover, I am uplifted to read about different things, that otherwise would have not crossed my way, engaging articles on topics that broaden my understanding and horizon about all we are confronted with in our lives. Nothing replaces a newspaper, so I now buy (more regularly than when the Daily still existed) the Globe & Mail and/or National Post on Saturdays. I thirst for well-researched journalistic articles – on paper.